Fantastic words of wisdom from Soke Hatsumi! How many of us come into training with our own preconceived expectations of what we should be doing or what we should be taking away from class? Well, I know that I have, but I have embraced “Learning from zero”, or starting with no preconceived expectation, and every time I apply this my knowledge and understanding of the arts takes a leap forward. Wisdom to ponder and apply in your life, so I hope you take this great lesson and apply it. My deepest apologies for being off grid for the past few weeks, it has been incredibly busy. Many of you do not know any of my background other than what I post throughout the web, but I am not only a martial artist but an executive in a major business dealing in the defense industry, so it was 2 ½ weeks of traveling and a few time zone jumps but I am back in the thick of things once again. During my travels I kept a positive training regime going but focused more on a cardiovascular and mobility increase as I had taken a shoulder injury in training and was somewhat limited for a few weeks for healing as well (Old and decrepit…NOT!). So what does this title of this post mean? Well, this is how many days are left in this year for you to accomplish new goals and training activities. It seems like time goes faster and faster, but we all know differently. 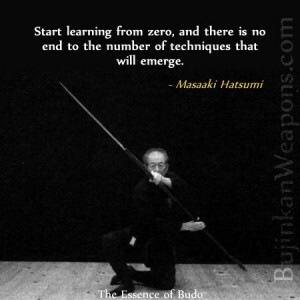 What objectives have you set for this year to allow you to gain new knowledge and improve your martial and life skills? I hope you set this earlier this year and are making small incremental achievements each day and training session. This year I have planned many new lofty, stretch me to the breaking point goals that I am tracking on a daily basis, throughout many areas of my training and life, and the other day when I sat down to start writing this post, I realized time was flying and I needed to renew my efforts! But, you might say “What does this have to do with ninjutsu?” and my answer is: This is the Ninja Lifestyle! Constantly improving and removing the excess so that you are sharp and ready for whatever life throws at you and your loved ones, and trust me life can throw a lot at you, at any time. So my words of wisdom to you are meant to encourage you to dig down deep and make a renewed effort toward improving your ninjutsu skills, step up and do it now! Ps: Thank you to everyone for the recent onslaught of emails and texts for ideas, questions and concerns ! What a great long weekend, training, working around the homestead and having some fun as well! Monday morning, I woke early had a cup of coffee and planned my day, then I got the trail shoes on, picked up my wakazashi(wooden version) and set off for a trail run. Awesome, morning running the game trails, parrying and practicing various cuts, counters and movements all while maintaining my pace on not so easy terrain. I look back and remembered when in “The Empire Strike Back” Luke is running through the Dagobah swamp leaping and training all in the deepest surroundings of nature. During the day, I took to digging and moving large rocks, often practicing various lifts with them to add some weight bearing exercises to the day. All this is just a normal day around here, working the garden, rebuilding a dam, cutting wood, all in nature and at each task I try and come up with ways to enhance my martial skills. Training in a natural setting has many benefits, most of which I have written about here several times, but the run and sword work the other day was just a reminder to be creative and use what is around you for training partners! No matter where you are located you can find some place to practice outside, often it can be a running trail, school playground, track, football or baseball field, parkour running in the streets, whatever it is get outside and Just Do It! As this day begins to wind down for many of us, I would like you to think about all of the warriors that have gone before us, to serve our country, to serve our country in foreign lands and those warriors who continue to do so. For those of you who serve, Thank you for your service. Airyu- Back to Living the Ninja Lifestyle! Sorry to have been away, I am on my last leg of three weeks worth of traveling and training that came on me somewhat by surprise, but I have embraced it and this weekend is the last hump before I get back on Sunday. Stay tuned for new material coming out next week. Airyu – The traveling Ninja!